Last year The Guardian declared that chatbots, automated systems which are able to respond to user queries without human assistance, will “transform the way you interact with the internet”. There is no doubt that artificial intelligence (AI) and machine learning are one of the top digital marketing trends in 2018 and it is even predicted that by 2020, customers will manage 85% of their relationship with the enterprise without interacting with a human. Because chatbot technology is moving so quickly, it’s essential for every marketing pro to stay updated. Read further to gain the must-know insights of what is a chatbot and why should you be using it to boost your marketing strategy. Chatbot technology is not a new concept, they have been in use for a long time. For instance, The Turing test has been around since the 1950s, while AI (artificial intelligence) programs have been around for decades. Also, the automated customer-service robots that assist you when you call an 800 number can be considered an early form of chatbots. 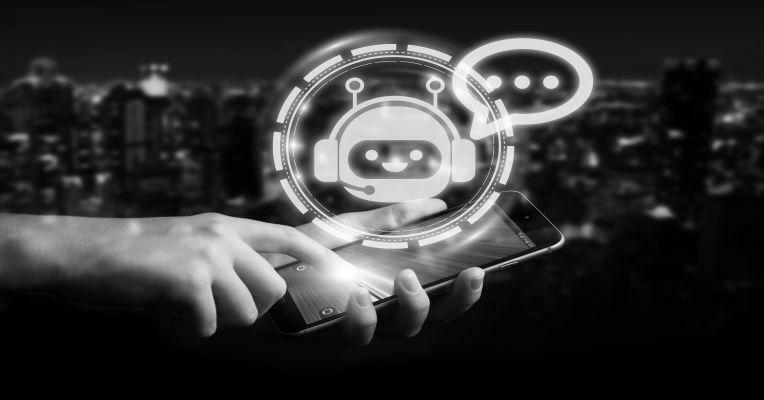 However today, chatbots are much more sophisticated and they make use of high-level AI that makes many chatbots indistinguishable from actual human communication. Chatbots utilize AI to mimic conversation, they use Natural Language Processing (NLP) that gives them advanced ability to comprehend and interpret what a user is saying. What is more, they are constantly evolving – now they are able to reply to users not only in text but also by using audio, videos and even GIFs. Chatbots can be connected to a variety of data sources via APIs to deliver information and services on demand. Instead of a one-sided question and answer format, increased intelligence allows the chatbot to change the subject, suggest related topics, and even demonstrate humor and emotion. That technology is constantly innovating and reinventing itself to become an unparalleled force is a given. With the advent of Blockchain and Artificial Intelligence, there is a profound shift in the world of technology and the way it interacts with us mere mortals. So, how does eCommerce fit in all this? Branded or service chatbots – a solution to improve the services provided by companies and enhance business performance. They are used to improve customer service, optimize marketing strategies and gather clients feedback. Informational chatbots – they provide important data for the persons who require it. Well-known informational chatbots include Siri, Cortana and Amazon’s Echo. They are not built to serve any marketing function but exist to help people with a wide variety of needs. Regarding the service chatbots, there are already more than 30,000 active chatbots built into Facebook Messenger, and they’re also available on other messaging platforms, such as WhatsApp, Apple iMessage, Wechat, Telegram, Skype, Kik, and Slack, to name a few. 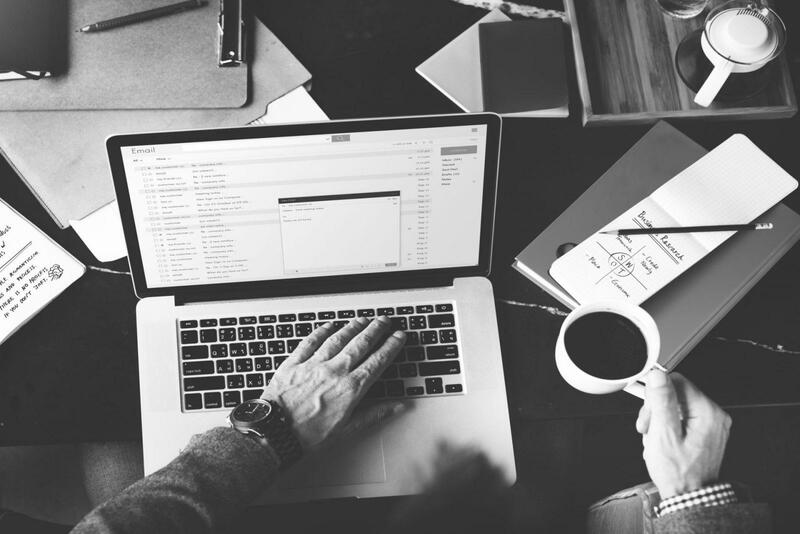 Ubisend has researched that just under 46% of users would rather contact a business through messaging than email, while 49% would rather contact a business through messaging than on the phone. According to statista.com, WhatsApp and Facebook Messenger each have reached 1.2 billion of monthly active users. WeChat — 938 million. Consumers are spending more and more time on these messaging apps and companies have to be part of the conversations. In fact, in a recent study by Retale, 60% of millennials revealed they have used chatbots already, and further 71% said they would try chatbots from major brands. 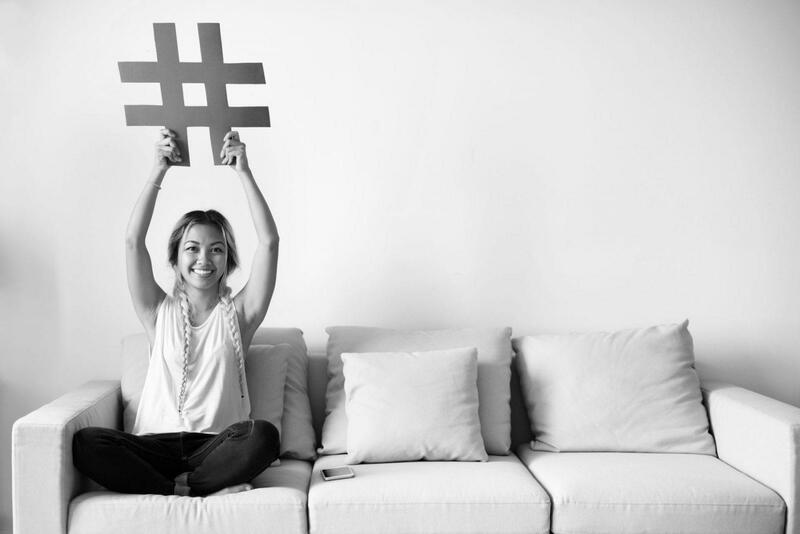 As a marketer, take into account that consumers prefer to communicate through messaging and don’t want to be put on hold for hours. With chatbots, it is easy for businesses to incorporate effective forms of communication in their marketing strategies. By maintaining a presence on a messenger app via a chatbot, you can save money and at the same time remain available for your customers 24/7. The survey was conducted by First Round Capital among 869 venture entrepreneurs from the US that work in IT - each one has stated his relation towards trends that have been on the marquee. Bronze prize was given to chat bots, sharing the pedestal with AR & VR's gold and Wearable technologies industry's silver - how has it happened and why, are chatbots and conversational UIs really overrated? 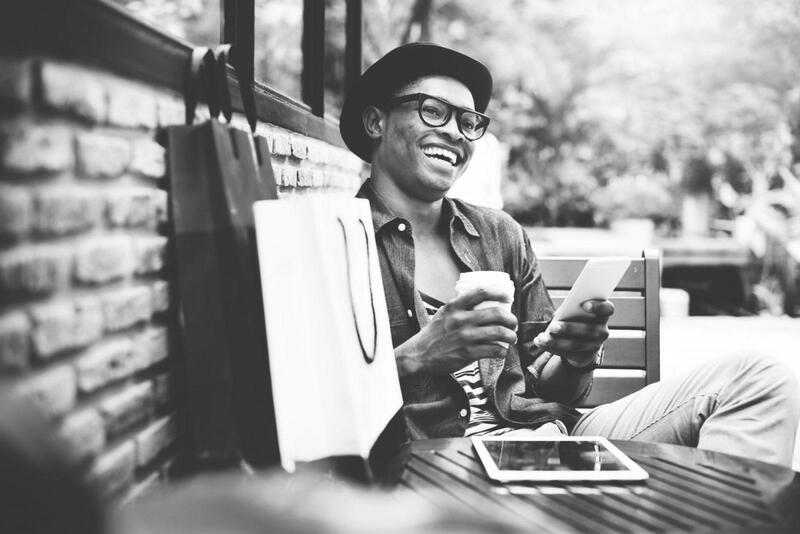 According to Microsoft Global Customer Service Report, 66% of US consumers are willing to spend more with a company that provides excellent customer service. Meanwhile, 60% reveal that they haven’t completed an intended purchase because of a poor customer service experience. It is no doubt that customer satisfaction is the holy grail of marketing. To satisfy your customers, you have to be at their service 24/7 ready to instantly answer their queries any time of the day. Sounds impossible from a human standpoint, but easy for chatbots that are available any time showing your consumers that you are attentive and always ready to help them. 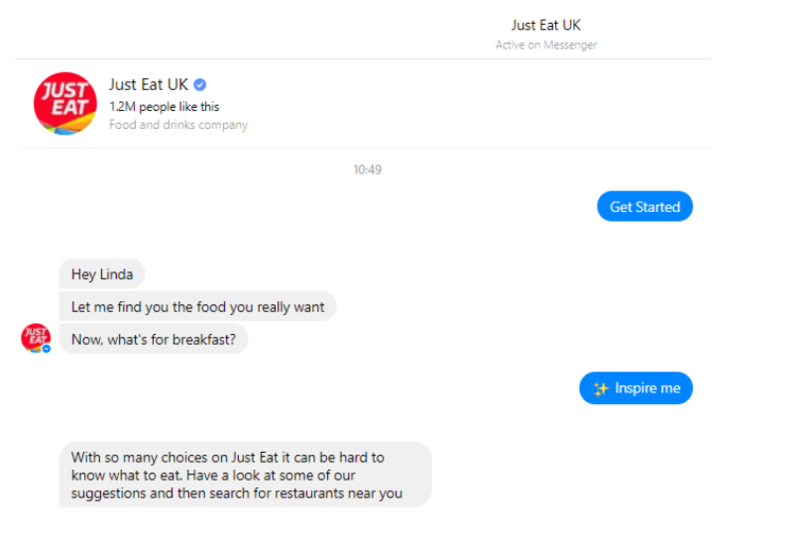 Take an example from Just Eat that has added an element of fun to finding takeaways by installing a chatbot that lets people search restaurants near them with emojis and keywords. Customers can type “breakfast” or send a food emoji and get recommendations of results near them. Thousands of people have used it, on average spending 1.53 minutes interacting with the bot. It has helped drive new customers, encourage repeat orders and improved awareness of Just Eat’s partner restaurants. As chatbots come mobile optimized, you don’t have to go through any additional trouble to reach your mobile customers. And what is more, they are easy to implement. For instance, Taco Bell’s TacoBot app is a chatbot integrated with Slack and it lets users chat, order and pay directly from Slack. Additionally, TacoBot app can provide quick answers to questions and offer recommendations no matter where their customers are. Chatbots are improving with time and can produce a lot of data about customers, their purchasing patterns, the way people are interacting with your brand and the level of engagement with your website. These insights are useful for companies to capitalize upon and can be used for businesses to tweak and personalize future marketing campaigns. It provides essential insights for further improvements of regular problems customers encounter and it makes personalizing a consumer’s shopping experience easier. Another way of getting valuable insights and see how advertising via bot helps your partner companies grow, is using URL shorteners (such as Capsulink, Goo.gl, Bitly.com) for ad links that provide you with analytics such as visitor’s behavior, referrals, locations, and dates to understand how productive the ad campaign was. What is more, some chatbots are created with the main purpose to gain analytical insights about your customers. 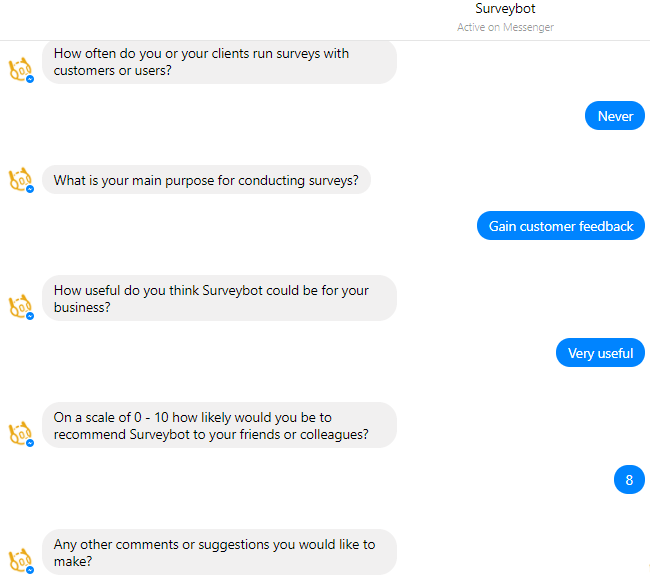 For example, Surveybot is a bot that allows you to send your customers surveys after the completion of a task—a purchase, a download, registration, etc. 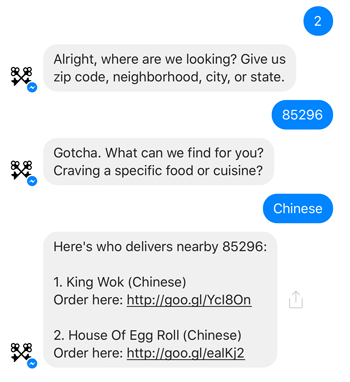 You can send the SurveyBot-generated link to your Messenger bot to your customers at any point. Afterwards, using the information that chatbot has collected, you can create customized messaging that guides the consumer along with his customer’s journey, and helps to achieve higher conversion rates. Another benefit of chatbots is the possibility to create personalized ads. When a customer interacts with your chatbot with an inquiry, the chatbot greets the customer and gathers some preliminary information. Then, the given information can be used to generate personalized advertisements. More importantly, this advertising is intelligent, the help is on-demand, and it will feel like the customer is being assisted rather than sold to. For example, eBay’s ShopBot bot is aimed at helping consumers narrow down the best deals from eBay’s over a billion listings. Once you’ve told the bot what you’re looking for, it will ask you to narrow down your choices. 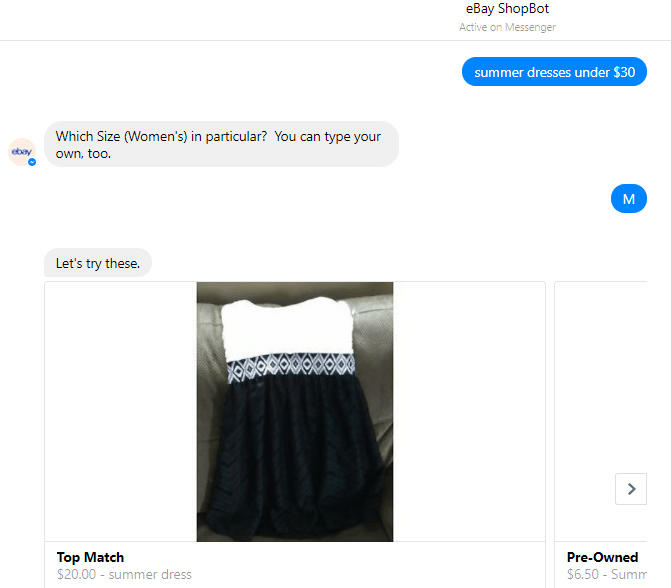 After your selection, the bot texts back some of eBay’s listings that match your description. If you click on the item, it will open up eBay in a separate window. Direct messaging, even through chatbots, enables more intimate interaction with customers. As noted, chatbots provide that your business answers customer’s queries any time thus giving them more chance to engage with the brand. As chatbots are designed to feel like you’re talking to a human, customers won’t feel like it’s purely marketing. While many brands employe passive customer interaction, chatbots are perfect for brands to reach out to their customers first. With the help of chatbots, you can let the customer know that the brand is present and available to assist, thus boosting the feeling of closeness to the brand. 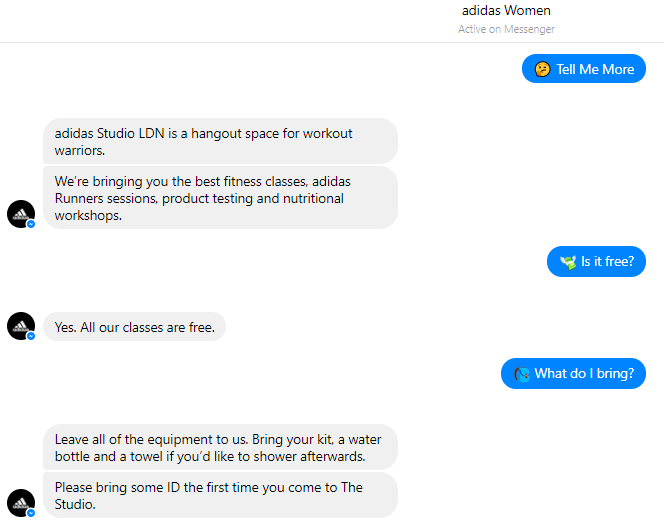 Adidas has used a chatbot to create an interactive booking process for their female-focused community space Studio LDN. The Facebook Messenger chatbot is the only way for the customer to find out about sessions and register as well as find weekly schedules and information about the classes. It allows deeper engagement between the brand and consumer through regular one-to-one conversations. To drive engagement further, as soon as a booking has been made the user receives reminders and messages from influencer fitness instructors. A lot of great examples of chatbots can be seen in the entertainment space where they enable the narrative of a story to take new places. For example, the producers of the film Sicario created a Twitter bot that allowed users to find encrypted messages from members of a drug cartel and help the DEA bring down the cartel and TV show Humans created a Messenger bot that allowed users to communicate with characters from the show. Similarly, Disney’s movie Zootopia was advertised by letting users go on a crime-solving mystery adventure with one of the movie’s characters – Officer Judy Hops. Amazingly, users spent an average of 10 minutes interacting with her. So every marketing pro should take the example from the entertainment field for implementing a dialogue with a customer that can occur over multiple sessions to build interest while evoking a brand’s positioning. App aggregation means that a single chatbot can be connected to multiple apps, allowing marketers to solve multiple customer queries at once. For example, last year Assist aggregated apps like Uber, GrubHub, Eat24, Onslet, Flowers.com, and others to serve the various needs of customers and Luka (now Replika) offered messaging service for recommendations regarding food, weather, news, or whatever it is that customers want to know. How To Build Your Own Chatbot? OnSequel – enables you to build chatbots for apps such as Messenger, Kik, Viber, and Telegram. It doesn’t require any coding knowledge. Simply answer a few questions and a bot will automatically be generated. You can even get started for free. Chatfuel – focuses mainly on Facebook Messenger and it’s free if you’re not getting over 500,000 monthly active users. Bostify – as it’s using an easy ‘drag and drop’ template designer, you won’t need to worry about having any developer skills. 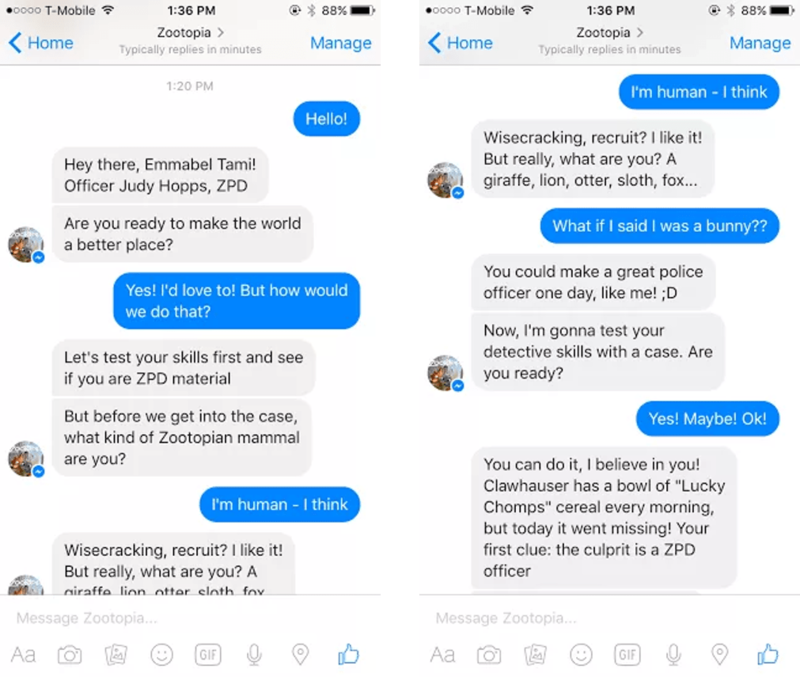 Chattypeople is a great chatbot platform for creating an AI chatbot on Facebook with integrated Facebook commerce. It’s simple to use, no coding is required. To get started it’s completely free. Facebook Messenger’s official page offers to build your own bot directly through the platform’s landing page. This method though, may be a little bit more complicated than others. FlowXO creates bots for Messenger, Slack, SMS, Telegraph and the web and allows to create various flexibility in bots by giving you the option to create a fully automated bot, human, or a hybrid of both. AI is slated to be a massive business driver for eCommerce. Can you share your thoughts on how AI will transform the eCommerce space and make for a better online shopping experience? Let's start from the customer end. Currently, a sale is thought to be a zero-sum game, either the buyer or the seller wins. Don’t build a chatbot just because you can. Have a clear goal and strategy in mind. Ensure security – make sure you do your research and choose a secure platform. Give it a unique name that makes it stand out. Provide users with hints and options on how to get started. Try to mimic a natural conversation flow, avoid over-complicated grammar. Make sure to promote your chatbot so people realize your business has one. Monitor and optimize your chatbot to increase its performance. Make sure your customers are still able to interact with humans in your business. Chatbots are a great way to improve your customer service but they shouldn’t be used to replace actual human interaction completely. Alexander @Bickov is a Riga based product designer with over 15 years of UX design and digital marketing experience. In his work, he aims to connect people and products by using strategy, creativity, and technology. Alexander has built digital services and products for organizations ranging from agencies, startups to large companies. His work is featured in the iOS App Store, Wall Street Journal, CNN, Business Insider, Forbes and Big Think.